Photo credit: Princess P. Ganuelas. I knew that Facebook could be a mosh pit of drama, political turmoil, and exes re-connecting with each other. I didn’t know that Facebook could be used to receive, send, and extract money to and from your “friends.” The longer I’m on Facebook, the more this statement is based on actual fact. My Filipino co-workers complain about family and friends asking to borrow money — which, let’s face it, is not actual borrowed money but a “donation” that will never get paid back, ever. The Philippines is still largely a cash economy; citizens are generally mistrustful of banks and other financial institutions because of corruption and fraud, and money in banks could quite literally vanish. (This is actually trending on Facebook as I write this.) Thus, Filipinos tend to lend and borrow money from each other, and as far as I can tell, the receiver always wins, and the giver is almost always screwed. $63: One of my cousins who still lives on the family farm asked me to be a godmother to his third son. I could write a whole post about how godparenting in the Philippines is a whole business unto itself, but I’ll keep it brief. I don’t know what prompted his request, but he said something like “I’m so glad to talk to you again after all these years.” After consulting my sister-in-law on what would be an appropriate amount to give, she suggested the equivalent of $10. I thought that was chintzy, so I settled on $20. I’m relieved that $10–$20 is an okay amount to gift because in the U.S., my default cash gift is $100 and above, and from what I’ve learned, $100 is the equivalent of a monthly wage for some Filipino blue-collar jobs. Wiring money in an actual bank costs $8 and takes about three business days, but in return, you get the highest exchange rate. Xoom charges $5 and only pays out about 48 PhP to the dollar. Whether I go to the bank or use Xoom really just depends on my mood, so you’ll see throughout the post that I’ve used both. I also felt chintzy just wiring $20 at the bank, so I added $35 for my sister-in-law who’s in charge of transporting the cash to my godson. I realize that she’s getting more money than my actual godson, but I wanted to thank her for managing my clan’s personal and business affairs. $100: My cousin in Colorado posted a fundraiser for her son’s school. I’m absolutely weak over the words charity, education, and children, especially if they’re all in one sentence. I donated $100 and learned that it was “above and beyond” what most people gave. $118.13: I learned through Facebook that some cousins and former co-workers were pregnant and in lieu of attending baby showers (see: deeply shy and introverted), I sent presents. $36: Food is another love language for me, and while I was at the bank, I saw a Facebook ad for a much-loved fast food joint, Jollibee, delivering food to loved ones in the Philippines. 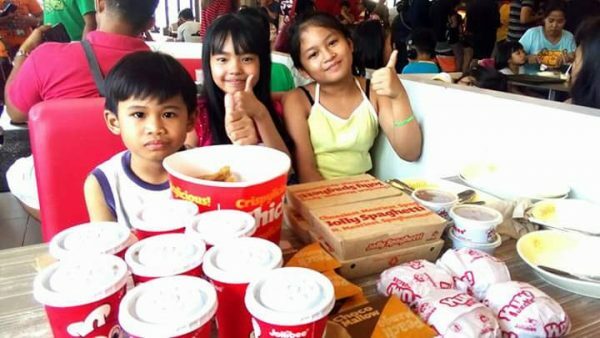 Kids + Jollibee = endless cool auntie points. $126.13: It’s the holidays! I was feeling extra expansive in 2017 because, despite the whole entire world going to hell, my personal life was top-notch. I discovered through Facebook that an old schoolmate started a catering business, so I paid her to cater my family’s Christmas and NYE dinner. She’s also running a soup kitchen, so I added a few extra dollars to support the cause. I used my credit card through Xoom and a couple of days later, I found out I was charged an extra $10 and I’m not sure why. $58: I just remembered I have twin godchildren through a second-degree cousin. Being a godparent in the Philippines means you’re signing up to be a de-facto gift-giver for birthdays and Christmas; this is the first time I’ve given anything and they’re seven, so I wired $50 plus the $8 fees. $33: Sister-in-law’s birthday, with $8 fees. $0: Some schoolmate asked to borrow money and I ignored the message, then spent the workday feeling and looking like a shocked emoji. $70: Mom has a January birthday and one of my nephews has a birthday in early February. This is when I started regretting opening a Facebook account; I used to be able to ignore birthdays, but I can’t do that anymore. My mom made a more-aggressive-than-passive comment about never getting anything for her birthday, so I wired her money. I feel bad that my nephew wasn’t part of the Jollibee feast (he lives about 4 hours from his cousins), so I told his mom and grandmother I’ll be paying for half the costs of a small-ish birthday party plus $5 fees. It’s a lot less than I thought it would be, but it’s still a significant amount of money. I don’t ever regret filial and charitable giving, but this year I’ll have to be more discerning — and more importantly, I can’t let “likes” and cute kid pictures manipulate me into overspending.